Salad bars are the heart of the meal program at San Diego Unified School District, and with the bountiful farm-fresh harvest of Southern California right on their doorstep, it’s easy to understand why. 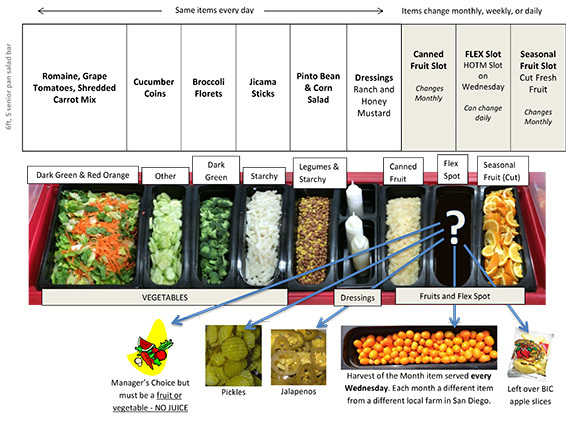 Since 2006, San Diego USD has been introducing salad bars to their 132,000+ students. Almost ten years later, the district has over 300 salad bars dispersed throughout 180 schools—31 of which were donated by Let’s Move Salad Bars to Schools! We recently spoke with San Diego’s Farm to School Specialist Kathryn Spencer, who has taken the lead on maintaining the extensive salad bar program since she began with the district two years ago. So, how does a large district maintain such a wide-spread and successful salad bar program? “Our people are our best resource,” Spencer reports, but with approximately 1,400 food service employees throughout the district, it’s no small task training them all on how to prepare, monitor, and clean up the salad bars. The key is to provide training materials that are consistent and made readily available throughout the district. Spencer has found that a good way to cut costs when purchasing fresh fruits and vegetables is to do the processing at the district level rather than ordering pre-processed produce. She notes that she has “…100% noticed the difference in the freshness and quality of the items we prepare ourselves, which the students appreciate.” But when 19 central kitchens each receive three produce deliveries a week in order to feed 132,000 hungry mouths, that requires a lot of chopping and slicing. That’s where the industrial-sized equipment comes in. With funds they received from a substantial equipment grant from Community Transformation (a now defunct program of the CDC), San Diego has purchased Sunkist Sectionizers for fresh cut citrus as well as a number of Robot Coupes, to slice and dice items like cucumbers and other seasonal fruits. “It’s definitely important to provide training for staff on things like this,” Spencer asserts, “…because we’re coming back to a point where scratch cooking and doing this level of prep in our kitchens is the norm, but it had not been happening for a while.” The robust training program involves detailed usage manuals for each piece of equipment, site visits from area supervisors who have already trained on the equipment, and kitchen demonstrations throughout the district. Once the items are prepped, San Diego has 20 internal delivery trucks moving the freshly processed produce to each individual site. Once there, it’s up to one or two cafeteria employees to set up, monitor, and break down the bar for lunch service. At the beginning of the school year, another manual is provided to every site with colorful diagrams and schematics explaining why and how to lay out the different offerings. “I think that we’ve engineered our salad bar menu to fit really nicely with the required vegetable sub groups, and I think salad bar service is a great way to provide those required subgroups and still offer a variety to students,” says Spencer. San Diego strives to serve as much local produce as possible, and as part of that initiative they began a “Harvest of the Month” program to accommodate the local growing season. The produce pointers that Spencer distributes every month contain information about what the Harvest of the Month offering will be (this month it’s organic peewee avocados harvested 25 miles away). The pointer gives specific instructions to staff for prepping the item. For example, Spencer has asked her staff to prep the avocados just before service to prevent them from turning brown. She also includes a farmer card with a cling back so it can be displayed on the salad bar plexi-glass directly above the item. The farmer card provides students information about that month’s featured fruit or veggie, including where it came from and who grew it. San Diego USD emphasizes their commitment to local, farm to school procurement in their district wellness policy, and has worked alongside parents, community members, and farmers to define what “local” means to them. For San Diegans, local means items sourced within the county line, plus 25 miles above the north county border, where the bulk of citrus growers are situated. Before Spencer joined the San Diego team, she worked for 11 years within the non-profit farm to school realm, so she is familiar with and passionate about educational activities that bring the farmers and their stories to the school too, not just their harvests. “When I initially came into the district, my experience was in connecting kids to where their food comes from, and coordinating farm field trips,” says Spencer. But working in the second largest district in California, getting the kids out to the farm is logistically very difficult. Spencer’s solution is bringing the farm to them in a Harvest of the Month video that she and her team produce and edit on an ipad. “They’re a way of taking our kids on a virtual farm field trip.” The three to four minute videos provide information about the farmer, how the produce is harvested, and a history of the item as well as its nutritional properties. Spencer notes that in the schools where these videos are embraced and shown by teachers regularly, she sees a real difference in how students respond to trying the new items. “Encouraging kids to try new fruits and vegetables is always something that needs to be thought out, reinvented, and approached in different ways.” Certainly, Spencer has come up with an innovative and engaging program for San Diego Unified School District.